We feel extremelyproud of our alumni Sarvesh Nehra & Jitendra Kaswan as they launched their own book yesterday in University of Rajasthan. 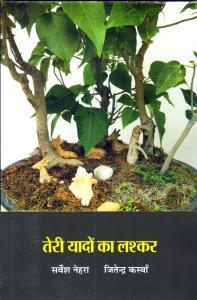 It is a piece of exceptional literature from these young lads from Jhunjhunu. Both Sarvesh and Jitendra are currently studying engineering and are pursuing literature as a hobby. They have certainly created a benchmark for everyone to take their hobby seriously and follow their own passion. Congratulations Jitendra & Sarvesh. We highly recommend their writing to all hindi literature enthusiasts. Let us buy their book and encourage these exceptionally talented young authors. To convey your wishes and buy your copy of the book, you can get in touch with the authors at - 9462681968 (Sarvesh), 9799955568 (Jitendra). SMILE PLEASE. Akshay Budania, a bright student of JAS from LKG to 12th, makes us proud once again by winning the innovation competition at IIT Delhi. Akshay was a merit holder in X board and is currently studying Mechanical Engineering @ IIT Delhi. His team lead by Manish Vig, another IITian designed a portable wardrobe that fits in two suitcases. They presented this idea and competed with M.Tech students and were adjudged among the top three innovations beating all. We are indeed proud to have alumni like Akshay. Congratulations Akshay and we wish you even greater successes in life !! Jhunjhunu Academy student of commerce class of 2008, Mr. Akash Modi has been awarded with an international scholarship by Singapore Institute of Management, Singapore. 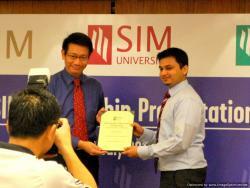 He is awarded this scholarship for academic excellence and leadership showcased during Diploma in Management Studies at Singapore Institute of Management. With this scholarship he is invited to pursue his B.Sc. in International Business at University of Birmingham, UK. It is to mention that University of Birmingham is the oldest university of England and is considered one of the best for its International Business course. Akash is also nominated as the Residant Leader for this course. It is indeed a great honour to have students like Akash Modi as our alumni. The entire Jhunjhunu Academy family feels proud for his achievement and wishes Akash greater success in all his future endevours. Jivem was witness to yet another felicitation of its brilliant students. This year six of Jivem students cleared their CA final examination. On the other hand 17 students cleared CPT. Ayushi Ranasaria, Ankit Gadia, Harish Ranasaria, Ankit Halwai, Sunil Tibra and Amit Dadhich have cleared their CA final examination. Naveen Pansari, Chirag Dhandharia, Nilesh Verma, Rajesh Jangir, Rakesh Matolia, Yogesh Dadhich, Rahul Verma, Vasudev Pareek, Mohit Agarwal, Sandeep Kumar, Gaurav Mishra, Saurabh Agarwal, Lokendra Singh, Inderjeet, Rahul Kedia, Vinay Goenka and Ankit Khaitan cleared the CPT. Jhunjhunu Academy campus was brimming with ecstasy while these young talents were being felicitated. Jivem Chairman Dr. Dilip Modi congratulated the achievers and wished them a bright future.